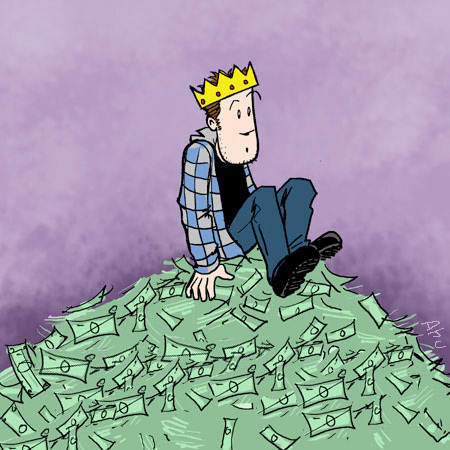 In an effort to get back into regular blogging again, I’ve decided to do a series over the summer revisiting the topic of helping cartoonists artists make more money with their work. Going on six years ago now, I put just about everything I know into an ebook “Cash For Cartoonists”. (link, it’s now “pay what you want”) I also offered one on one coaching to go with it, and boy did I get busy with that. I still offer some creative coaching on the side on a case by case basis, but I didn’t really set out to be the “Life Coach” for cartoonists. My ebook garnered some criticism from some of my webcomic contemporaries at the time as the title seemed like “GET RICH QUICK!” scheme. Of course the name itself was designed to catch your attention, and a little tongue in cheek, but it’s hardly a “get rich quick” or promise you can make money with your artwork. The bottom line is you have to have the HUSTLE first and put the work in. Over the past six years I’m proud to say that the Cash For Cartoonists has helped hundreds of creators and cartoonists. (some testimonials on that link back there) Many even went full time freelance after being inspired and using the methods to start earning more with their artwork. I still get messages and Facebook tags to this day from artists who were struggling and then found the ebook inspirational or a good kick in the pants to get moving! I’m also asked if I’ll be updating the ebook with new information. Lots of things have changed in six years since “Cash For Cartoonists”, there are definitely some things to add to each of the methods, which leads me back to this blog series. I plan on featuring each of the methods in the book in future blog posts right here (bookmark this!) And I’ll do my best to add as much new info and value as I can. And it’s all free. I love being able to share what I’ve learned from experience with other creators of all levels. Some creators are brand new, but others have been at this for a long time and maybe have overlooked a few avenues or should revisit some. Like many readers before, you’ll probably end up being surprised by how well some of these methods work, and things you never really thought of doing. Okay, so look for the first blog very soon, where I’ll tackle the first method “#1 SPOT ILLUSTRATION” – In the meantime, you can brush up on the old ebook and all 15 methods by downloading it now.